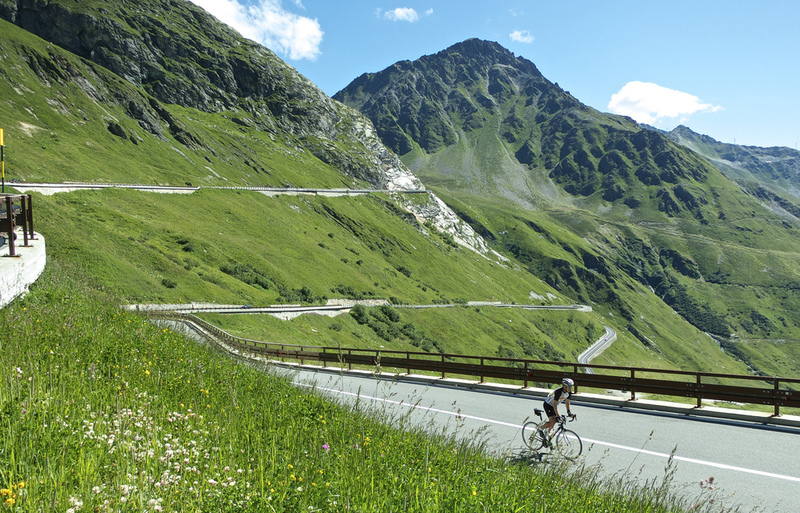 This is one of the truly great alpine passes. If Napoleon could cross the alps here — on a donkey and not on a stallion — then why couldn’t I? 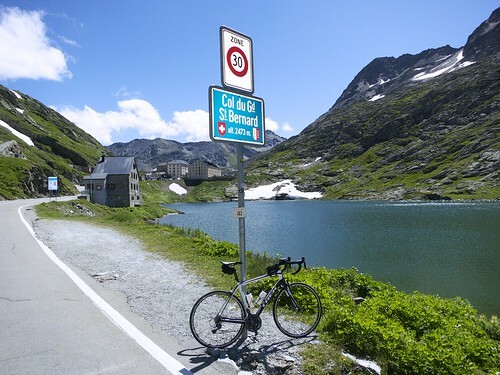 Colle del Gran San Bernando (Col du Grand Saint Bernard en français) is one of the highest Cycling Cols in the Alps at 2,469 metres (8,100 feet). And one of the longest at 45 kms from the Swiss side. This pass has been used for almost 3,000 years to cross the Alps. Julius Caesar crossed with an army in 57 BC. Today, along the route are signs with drawings commemorating Napoleon’s crossing with 46,000 soldiers in 1800. 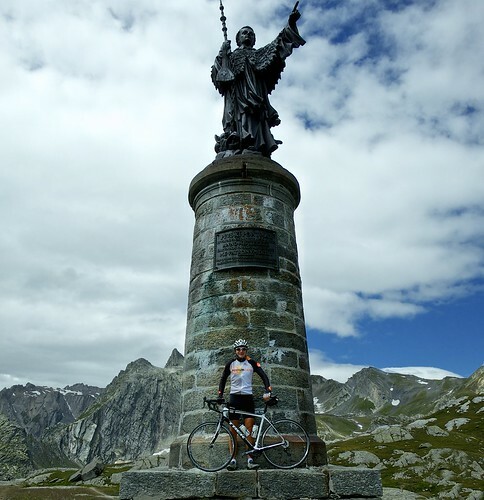 In the 900’s Saint Bernard of Menthon opened a Hospice at the summit to provide a safe haven for travellers – the hospice is still operating today. The Saint Bernard dog was first mentioned in 1709 and has become an icon of the alps. Stuffed versions were on sale everywhere at the top. 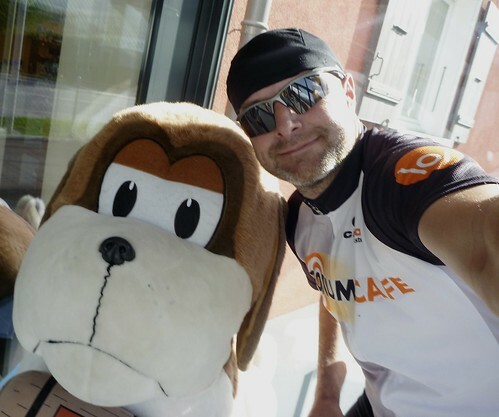 Down low in Martigny is a St. Bernard dog museum. As the map at the bottom shows, I started near the bottom of the Italian side, climbed to the summit, and only descended the Swiss side to the end of the old road. In other words, I did just the good stuff. The Italian side is far, far more interesting than the Swiss side. The first 40 (!) or so kilometres on the Swiss side is beautiful but has relatively heavy traffic including trucks. 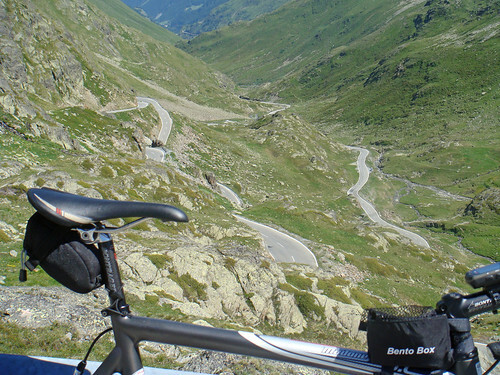 But roughly 6 kilometres from the summit, the traffic takes a huge tunnel, and a cyclist can enjoy the fabulous old road to the summit. On the Italian side, the main traffic leaves the old road much sooner. The huge hairpins have also recently been improved. This is a big, beautiful climbs. 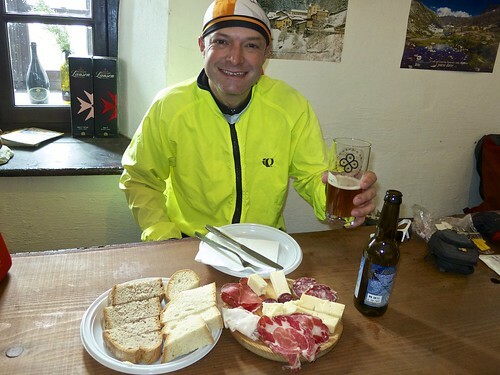 A little down the Italian side on the descent I stopped for an absolutely fabulous local lunch and ….. local beer! Cin Cin!